The Kujakuao, it is the blue that was dull, such as the color of peacock blue feather. 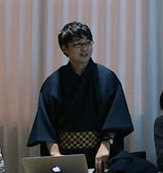 A relatively new color name, was introduced from the West by the time of the Meiji “peacock blue” what was Japanese translation. There is also a color called “Kujakumidori”, but it is the color name that can try Japanese translation here was also transmitted to the same period the “Peacock Green”. 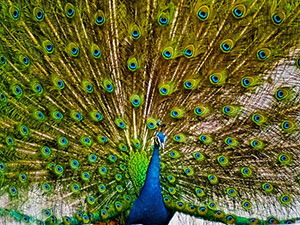 Peacock Southeast Asia from China, in the pheasant family of birds distributed in South Asia, male has a big vivid decoration feather, is the famous figure that invites an open female it in a fan shape. Other feathers are prized as ornaments, it was revered as beneficial bird from eating in favor of pest-Viper class. Also in Buddhism has become the subject of faith as a peacock Ming Wang. 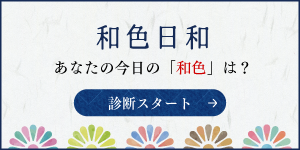 By the way, handed down to the peacock of our country is very old, I seen a description that Siragi has sent a peacock in Suiko in the “Nihonshoki”. When it comes to the time of Edo, to teahouse to drink the tea while watching the peacock had been referred to as the “Kujaku Chaya” in Osaka, but there are still a large number also as Japanese painting of the subject, and not lead to the generation of color name was seems.